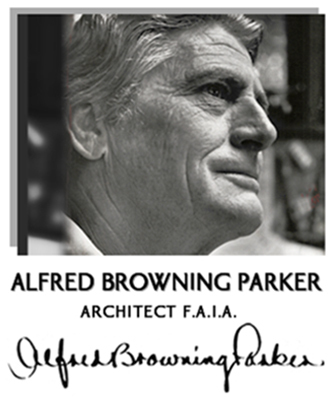 HOUSE du RIVAGE presents Alfred Browning Parker in Ten Things To Love About Architect Alfred Browning Parker. Ten Things To Love is the first documentary to bring the designs and innovations of this American master to audiences worldwide. Alfred Browning Parker was born September 24, 1916 in Boston, Massachusetts. At age 8 he suffered a serious battle with pneumonia. Shortly after, on doctor’s orders, his parents Jack and Jewel Parker moved the family of three to Miami. Alfred thrived in the tropical paradise of South Florida. His exploration and enjoyment of Miami’s pristine waters and wilderness nurtured a life-long appreciation of and respect for the natural world. A self-described “Homo Faber”, Parker liked nothing more than making things with his own hands. He chose the University of Florida to study architecture and was graduated in 1938. A bright and eager student, he received scholarships for post-graduate studies in Scandinavia and Mexico. Parker served in the Navy during World War II. He was stationed in Miami allowing him nights and weekends for architectural design and building. He was his own first client. As owner, designer and builder – “3-in-1” he called it – he put his education into practice. Over the decades he repeated this “3-in-1” practice with a total of nine homes for his family. A new site and plans for a tenth Parker family home were in the works at the time of his death in 2011. At the end of World War II the office of Alfred Browning Parker, Architect opened in Miami. With an emphasis on meeting the needs of the client and the climate, Parker’s “tropical modern” designs quickly gained popularity. His work was widely published – from private homes to a master plan for the city, he built churches & synagogues, banks & shops, restaurants, schools – even dog houses. He designed over 6,400 projects, and no challenge was too big or too small. With his prolific and distinguished designs, Alfred Browning Parker transformed the built environment in South Florida, and helped make Miami an international architectural destination. The oil crisis of the1970s coincided with the rise of post-modern design. As architectural tastes changed, Parker focused more and more on the research and development of alternative energy. His architecture practice continued, but reduced in scale. In 1985 he and his son Robin co-founded the Solar Reactor Technologies (SRT) Group, a company producing non-polluting hydrogen power from solar energy. More recently, Robin’s son, Melahn Parker, joined the SRT Group. Alfred Browning Parker ended his career where he started it – at the University of Florida. At the age of 82, his Miami office closed, he moved to Gainesville to become a professor at the U of F’s School of Architecture. The contents of his office were brought to the Smathers Library at the University – thus establishing the school’s architectural archive. Alfred Browning Parker passed away March 11, 2011 in Gainesville, Florida.